The earliest indications of an official building for Bridport dates back to 1150, where documentation suggests that a castle existed to protect Bridport. It also states that the keeper of Bridport Castle was taken prisoner by Henry II. Any structure would have been of wood, but although ground investigations have been carried out, no physical evidence has be found of a castle. In 1307, a toll house was built on the northern side of the junction at East Street and West Street. Its original function would have been to collect toll money for visitors or tradesmen wishing to enter the town. Later the toll house was renamed the Guildhall and used as a council chamber and local court. In 1782, the Guildhall was badly damaged by fire and had to be demolished. In 1785, an Act of Parliament was passed to build a Town Hall, for better cleansing, paving and prohibiting any new buildings from being roofed with thatch. At the junction where East Street meets South Street had been the ruins of St Andrew's Chapel, built in 1260 for Carmelite Friars. Part of the chapel had been converted into a dwelling house, part being the sessions house over which was a free school, a further part was a cell for criminals and part was in ruins. It had a low tower, with the remains of the Chancel serving as a clock house. In 1786, at a cost of almost £3,000, St Andrew's Chapel was demolished and replaced with Bridport's Grade I listed Georgian Town Hall and Market House. The cupola and clock were a later addition in 1806. Running through the structure of the Town Hall were ten octagonal shaped ship's masts to support the upper floor. The upper story accommodated a court for borough sessions, a separate room for the grand jury and a council chamber. The ground floor (Market House) was originally an open area, housing 37 butchers stalls, now only one. This area replaced The Shambles, or Butcher Row, which had been situated outside the Guildhall, straddling West and East Streets and presenting a health hazard, consisting of many butchers' market stalls along the side of the road and obstructing traffic. There still remained a lack of space, so a corn and produce (Corne & Greene) market building was constructed in 1788, located behind the Town Hall in an elongated octagonal single story building, but demolished in 1946, while a new cattle market location was found on the corner of West Street and Victoria Grove. In 1902, the Corne & Greene Market building behind the Town Hall was converted into a Fire Station. This housed a horse-drawn Fire Engine with Merryweather & Sons Steam Pump 'Greenwich Gem'. It was bought to commemorate the coronation of King George VII. In 1937, the ground floor of Bridport Town Hall was modified to accommodate public toilets on its southern side. During this work, four of the wooden columns or masts were cut off to support a new steel beam under the upper floor. In 1946, the Corne & Greene Market building was demolished to make way for a taxi Hackney Carriage stand. In 1974, following local government reorganisations, the Bridport Municipal Borough Council was replaced by Bridport Town Council and the council offices moved from the Town Hall to Mountfield, at the top of Rax Lane. The Magistrates' Court was also moved from the Town Hall to a new building next to Mountfield. 'Going over Town Hall steps' had become known locally as an unwelcome appearance before the Magistrates' Court. 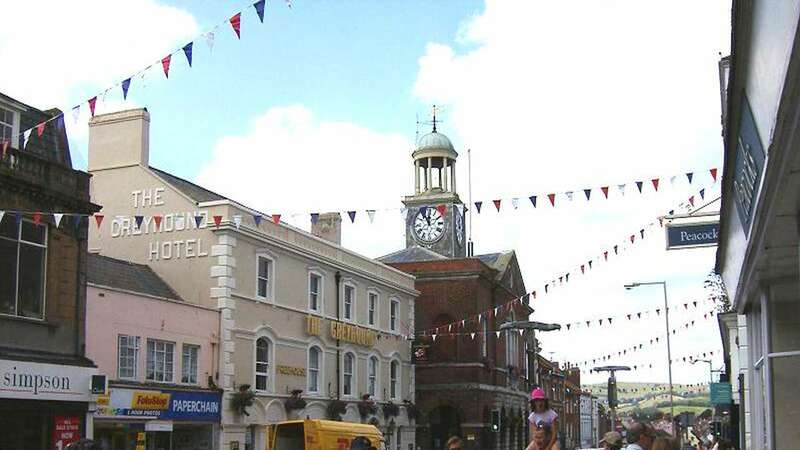 Although the passage between Bridport Town Hall and the Greyhound Inn had been known as 'Bucky Doo' for a number of centuries, the area previously occupied by the corn and produce market building was only referred to as 'Bucky Doo Square' from about 1995. In 2011, a heritage lottery fund was obtained, with additional funding from the Dorset councils, totalling £1.4 million to refurbish Bridport Town Hall, to remove the public conveniences and replace with a Tourist Information Centre, install a lift system, new heating, lighting and information technology services, all work on the Grade I listed building being supervised by English Heritage. The four wooden columns which were cut off during 1937 modifications were also reinstated.